The RIIM™ Parts describe the different parts you can use to build your RIIM™ Network, and the RIIM™ Tools are developed to support a project with fast to market requirements. We strive to make the tools easy to use and make the documentation easy to follow. The RIIM™ module is a complete, very low power-consuming IEEE802.15.4 g/e RF node with a 50 ohm antenna interface. The configuration is selected when the module firmware is created and programmed into the module by the boot-loader. The range between the RIIM™ module can be described as range between to points that have a free line of sight (LOS) in between, i.e there are no objects that will disturb the radio signal in between the nodes. We also provide a number that is derived from practical outdoor tests in downtown Oslo, we call this Urban. The number is an average reading and it varies depending on the specific location. The number will serve as a good indication for range expectations between two nodes in a real application. A leaf node can be put in “Sleepy Node” mode and only wake up when there is activity to report or read. The node is still active on the network, but in a very low level just to maintain the dynamic network. The average current for a “Sleepy Node” is less than 10 µA, which will enable coin cell battery operations or energy harvesting solutions. You use Mist Computing to reduce the required communication bandwidth. The ICI I/O is designed to provide a very simple platform to program any sensor/controller interface in high level C code with simple APIs to access the module’s resources and I/Os. Any sensor/controller that has a hardware interface using I2C, SPI, GPIO or UART can be interfaced to via the ICI I/O. Included in the IPM Modules, ICI offers the possibility to implement Mist Computing algorithms and create an interface to any sensor/controller. All programming is done in high level C coding and uses API modules that remove the need to manage the chip resources. Please click here for more details. The firmware used in the module can be updated over the air, including the firmware used for the ICI. This allows for bug fixes and other updates when the network is deployed. Interested in the RC1882-IPM, please click here to find the datasheets. The RIIM™ Border Router is a complete CE certified boxed product that will connect to the Internet via an Ethernet interface and CoAP. The core of the Border Router is the RIIM™-IPM module configured as a Border Router. The additional blocks are an Ethernet transceiver, a PCB, and the antenna. The Border Router is available in 4 variants, 2 frequency options, 868 MHz and 915 MHz and two Output power options, See the table below. 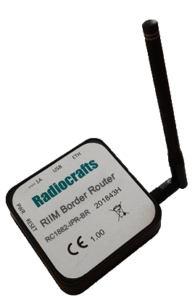 Please click here to find the datasheet of the RIIM™ Border Router. The RIIM™ Tools are developed to support a project with fast to market requirements. We strive to make the tools easy to use and make the documentation easy to follow. The RIIM™ SDK supports development of code for the ICI interface in the RIIM™-IPM module. The ambition is that a user should be able to write most applications for sensors/controllers in less than 100 lines of high-level C-code. Please find the RIIM™ SDK Quick Start and User Manual here. The RIIM™ Network Dashboard is a tool to check the network topology and status of the links between the nodes in the RIIM™ network. It provides the RSSI value and time-stamp for each connection in the network. The RIIM™ development kit includes all hardware needed to run a small RIIM™ network from a PC. This allows the customer to test the network capabilities with minimum development resources needed. This is ideal for a first range test in a customer environment. A RIIM™ Development Board, a development board with a RIIM™-IPM. A RIIM™ Sensor Board, a board with a RIIM™-IPM and 5 industrial sensors. Please find the RIIM™ development kit datasheet here. Please click here to see a full overview of the RIIM™ system.